A festive opening ceremony took place on 5 November 2010, marking the restoration of Saka Manor’s main residence, which has had a long and intriguing history, but stood neglected and in ruin for 20 years before its rebirth. See video! Historically, Saka was part of the Lüganuse parish. Today, the manor resides in the Kohtla municipality. The village of Saka is mentioned as early as the year 1241 in the Danish Census Book. Over time, Saka has had many names: Satzae, Satze, Szacke, Sackekülle, Grodt-Sacke, Sakka, and Sackhof. The manor – then known by the names Suur-Saka, Gross-Sack, and Sackhof – was established in the 17th century, after the King of Sweden Gustav II Adolf gave the surrounding lands to Jürgen (Jöran) Leslie of Aberdeen, Scotland in 1626. Leslie was from a powerful Scottish clan. It is well known that he was the alderman of Narva from 1627 to 1649 and lived mainly on his feudal lands in Saka. After Leslie’s death in 1651, Saka Manor was passed down to his inheritors, who kept it for another 120 years. On 28 September 1748, the manor was sold to Katharina Margaretha von Wrangell of the famous Pufendorff family. Her father, Esaias von Pufendorff, was the chancellor of Sweden and a government advisor for Denmark. Saka Manor remained in the possession of the Wrangells until 1808. The last of the Wrangells to own Saka Manor was Georg Gustav von Wrangell (1758–1808), born in the Maidla Manor. After belonging to the Tolls for a few years, the manor was acquired by the Löwis of Menar family. For the first 15 years, the property was taken as collateral for a debt, but it was acquired fully on 10 March 1827. The first in the family to own the estate was Peter Fromhold von Löwis of Menar, who was also the first in his hereditary line to live in Estonia, registering as a resident in the same year. Starting from 1783, only locally registered nobles could own manorial estates (Rittergut in German). In Estonia, the standard size of a manorial estate was 450 dessiatins (an archaic land measurement used in tsarist Russia), which included 150 dessiatins of farmland, as well as additional haylands and pastures. Two years after acquiring Saka Manor, Peter Fromhold von Löwis of Menar died in Saka, and the property became the joint possession of inheritors for around 10 years before it went to Oscar Gustav Woldemar Konrad von Löwis of Menar (1813–1888). The pledged property was registered to his name on 30 April 1839, and he became the true owner in 5 March 1843. From 1862 to 1864, the estate owner, who had for long served as a land adviser in Estonia, built the main residence of Saka Manor that survives today. Considering the background of Saka Manor’s builder, one might expect to find Scottish influences in the architecture, but the main residence of the manor is instead reminiscent of the Italian renaissance style, in sharp contrast to most other Estonian manors. Saka Manor may also have been the inspiration for the nearby Oru Castle with a similar villa-style light tower, which was built 30 years later, but nowadays it can only be viewed on photographs. Born in Maidla Manor, the estate owner’s son, Hermann Oskar von Löwis of Menar, spent his winters in Maidla and his summers in Saka. The son would later come to own the manors of Maidla, Aidu and Rääsa. A few months after Saka Manor was dispossessed on 25 October 1919, Hermann Oskar von Löwis of Menar departed to Germany and died thereafter in Schwerin in 1935. Unaffected by pervasive land reforms, the heart of the Saka Manor was kept on by the last representative of the hereditary line, Hermann Löwis of Menar and his wife. The townspeople of Saka remember Hermann as a modest man, the head of the local fire brigade, and a farmer, who raised cattle, kept bees and helped out on the farmland. He was a fluent speaker of Estonian. His wife, however, could only socialize with German-speaking townspeople. When they, too, departed to Germany on 2 November 1939, Saka became a military outpost. Its strategic location on the high shore of the Gulf of Finland offered militaries a stronghold for heavy artillery batteries and guarding the seashore. Saka Manor and the surrounding park were occupied in various periods by the armies of three countries: the Estonian coast guard; Waffen SS during the years 1941–44; and, with some intermediary periods, Soviet authorities held the area until 1992. 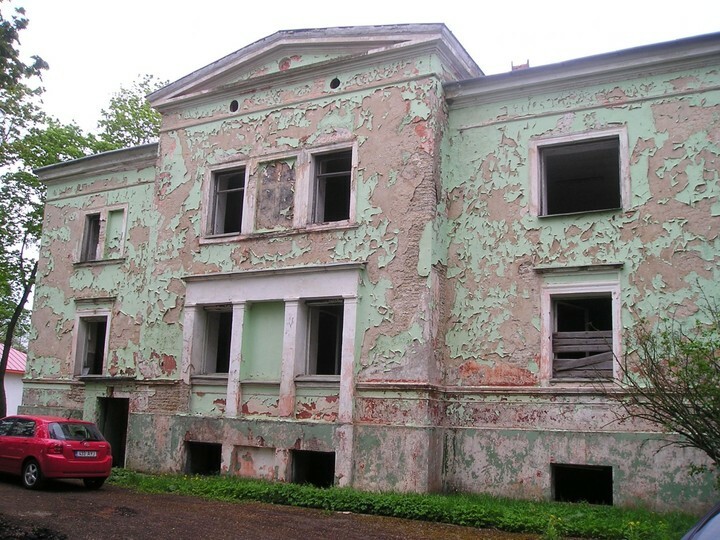 After the end of the Second World War, youths from throughout the Soviet Union arrived to build a chemical plant for oil shale in Kohtla-Järve, during which they temporarily lived in the manor’s barracks, which had been built by the German military. After the Soviet forces departed in 1992, Saka Manor was abandoned and left without a landlord. The doors and windows were left open, vulnerable to natural forces and vandals. The manorial park was overgrown, torn apart by trenches and littered with deteriorating military structures. The property lacked any kind of basic infrastructure, such as roads, sewage and electricity. Even the well had been ruined.